We could all use a little bit of serenity now. So in a very un-Seinfeldian effort to be a little more positive, we thought we’d explore the world of customer experience through a lens that a lot of us can easily understand and find some humor in. At Kustomer, we often find ourselves relating everyday life back to one of our favorite shows. Who among us hasn’t found themselves in a situation or misunderstanding with a retailer or vendor and thought, “Man, am I in a Seinfeld episode?” Maybe these Seinfeld situations are more relevant to our business than we thought? The question is: How can the Kustomer platform improve upon, or even prevent, these Seinfeld situations? Let’s explore a few examples. In The Alternate Side, Season 3, Episode 11. Jerry’s car is stolen and he’s forced to make a reservation to rent a car from Worthy Rent-a-Car. However, when Jerry and Elaine arrive at the rental counter, the agent informs them that the agency is out of cars. Jerry rightfully raises a stink because, after all, what does a reservation mean if it’s not respected? Even though I’ve never had my car stolen, I imagine I would have very little patience for this. There would probably be some four-letter words, and there would definitely be zero chance of me ever returning to that agency. However, Kustomer’s CX platform could have prevented this. What if Worthy Rent-a-Car had a customer support CRM that could integrate with their reservation tracking system? This integration could help Worthy manage their relationships better with customers, and ultimately improve lifetime value and repeat business. Upon realizing that there would be no mid-size cars available for Jerry on that particular day, Worthy could have let him know before he showed up and found a solution. Worthy could have reached out to Jerry through his preferred method of communication earlier in the day and made a reservation for him at a different location, or even at a competitor, in a show of good faith. Alas, they did not. Bad news for Jerry, but at least we are left with yet another hilarious encounter. Another Seinfeld situation that Kustomer could optimize is from The Pool Guy, Season 7, Episode 8. Here we see George, who gets home to his apartment to find a note from Susan indicating that she went to go see a movie with Jerry and Elaine. Worlds are colliding, and George is in a panic to find out what theater they went to so that he can intervene. Naturally, George called his trusted hotline, Moviefone, to find out where the movie was screening in his area. 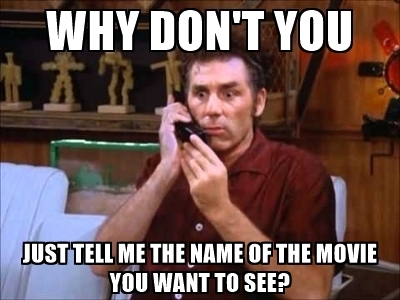 After some hilarious miscommunication with the not-so-automated Mr. Moviefone (Kramer), George eventually gets a screen time and location for the movie but hangs up before he hears the correct theater. Now, imagine if a modern day Moviefone had access to George’s entire movie ticket purchase history within the support platform. Moviefone could know who George was before he identified himself, and recognize that he usually sees movies at the Lowe’s Paragon at 84th and Broadway. Moviefone could then send George the showtimes for that theater, helping him realize there there is more than one showing of Chunnel, thus preventing another hilarious Seinfeld situation wherein George is removed from the theater by security. Moviefone had the opportunity to win George’s repeat business by incorporating all relevant information about him across systems and driving the appropriate action. Let’s also look at an example of good customer service, beyond the transaction. In The Hot Tub, Season 7, Episode 5, we find Kramer enjoying a recently installed hot tub in his apartment. However, the hot tub proves to be too much of a strain on the power in the old, pre-war building that Kramer and Jerry share. Caught in the middle of this power outage is Jean-Paul, Elaine’s Trinbagonian house guest who stayed at Jerry’s house to guarantee a good night’s sleep. Because of the power outage in the building, Jerry’s alarm clock does not go off and they awake in a panic, late for the New York City Marathon. How could this humorous plot be bettered by the Kustomer platform? Let’s assume in today’s version, Jerry has a smart alarm clock. In the Internet of Things, a support platform would be able to recognize that a connected device was taken offline and the alarm clock company could take proactive measures to get its device back online. Imagine that the alarm clock company phoned Jerry and informed him that his smart device was no longer connected to the internet. 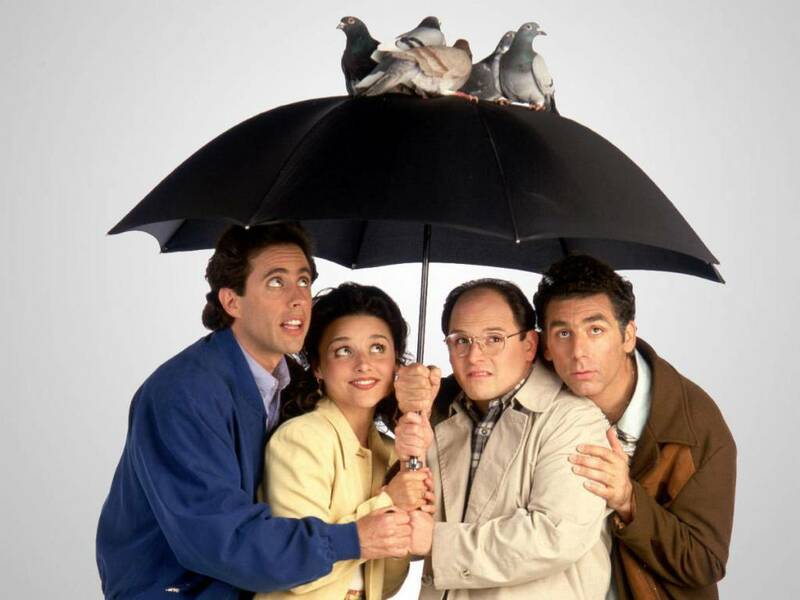 Kustomer’s platform allows IoT companies to recognize these outages and to act in the moment, thus preventing another great Seinfeld plot from unfolding. There are myriad other examples of poor CX in Seinfeld — the show’s plots are overwhelmingly based around amusing and relatable interactions between consumers and businesses. During the time the episodes were broadcast, these were customer service interactions that the population was used to and, unfortunately, expected. With Kustomer, Seinfeld just wouldn’t have been as Seinfeld-y. Now we expect businesses to know everything about us, and to minimize the frustrating little interactions that so many episodes of the show about nothing revolve around. If brands can understand our unique histories and create seamless service experiences, we’ll no longer feel like we’re trapped in a Seinfeld rerun. While that’s less funny to watch, it’s definitely better for you and for business.